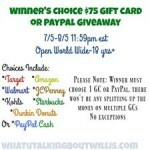 $75 Winner’s Choice Gift Card or PayPal Giveaway!! Welcome to our Happy Father’s Day PayPal Cash or Amazon Giveaway! From 5/26-6/16, we will be holding a giveaway for 1 lucky winner to receive their choice of PayPal Cash or an Amazon Gift Card worth $80! Entry-Form Disclosure: We reserve the right to make revisions, to cancel, or suspend this contest for any reason…. Celebrate Mom #75 Giveaway Ends May 5!! $100 Paypal Cash Giveaway Ends 12/16!